The three biggest cities in America—New York, Los Angeles, and Chicago—are cultural and economic epicenters in their respective regions. But none are especially popular with Americans seeking a better life. Despite the regions’ sizable populations and influence, migration to Northeast and Midwest America remains in deficit, as it has been for the last 40 years, according to U.S. moving patterns. So where are people moving? Southern and western states, according to recent data from United Van Lines and the Washington Post—specifically the Carolinas, Florida, and Texas in the South, and Arizona, Nevada, Oregon, and Washington in the West. Several periphery states are also seeing an increase of domestic move-ins. Why the shift in latitude and longitude? Job availability is a big reason. As industry and manufacturing contract in the Midwest, many workers head for high-tech employment elsewhere. That and literally greener pastures. “This year’s data reflects longer-term trends of people moving to the Pacific West, where cities such as Portland and Seattle are seeing the combination of a boom in the technology and creative marketing industry, as well as a growing ‘want’ for outdoor activity and green space,” explains Michael Stoll, an economist at UCLA. But employment opportunity and wide open spaces don’t tell the whole story. A lot of movers also seek better weather. “The aging Boomer population is driving relocation from the Northeast and Midwest to the West and South, as more and more people retire to warmer regions,” the United Van Lines study explains. 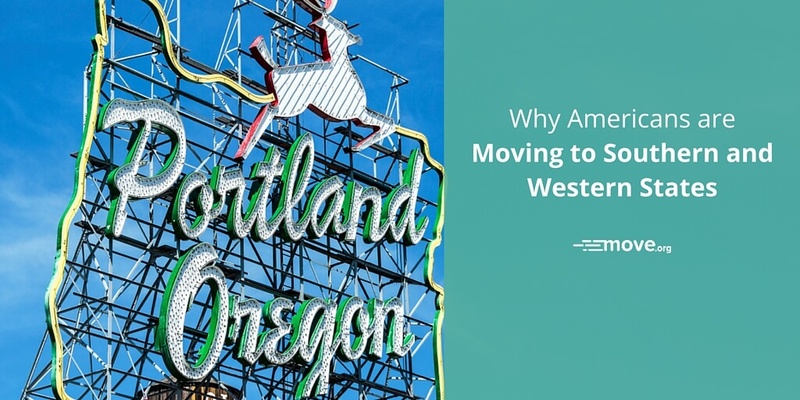 In addition to more jobs, greater space, and warmer temperatures, lower cost of living is also a significant factor for increased migrations to Oregon, the Carolinas, Florida, Washington, Texas, and especially Arizona and Nevada, the research shows. Consequently, crucial election states such as Florida, North Carolina, Arizona, and Nevada will become even more important than before when it comes to shaping the White House this year and beyond. As for states with the greatest number of defectors, New Jersey, New York, and Illinois led the outbound list last year, followed by Connecticut, Ohio, Kansas, and Massachusetts. West Virginia, Mississippi, and Maryland rounded out the top 10, which corroborates with internal Move.org data on U.S. migrations. Dwayne is a moving specialist for Move.org.